So there I was, ready to wax rhapsodic as spring returned, but winter threw a hissy fit. 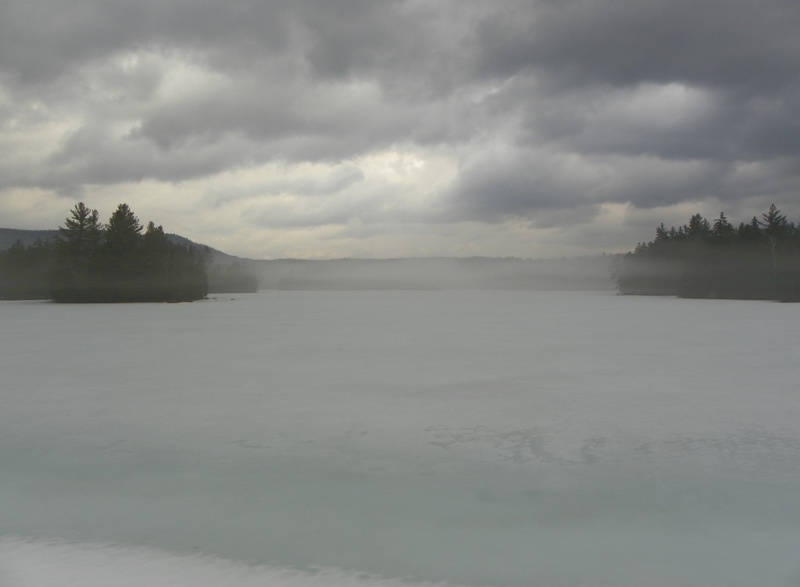 Sap flow, which had been sporadic at best, slowed to a trickle and the sugar house on Bobo’s Mountain went cold. That’s the way the season had been, with a few warmish days and good flow alternating with late snows and unseasonable chills. 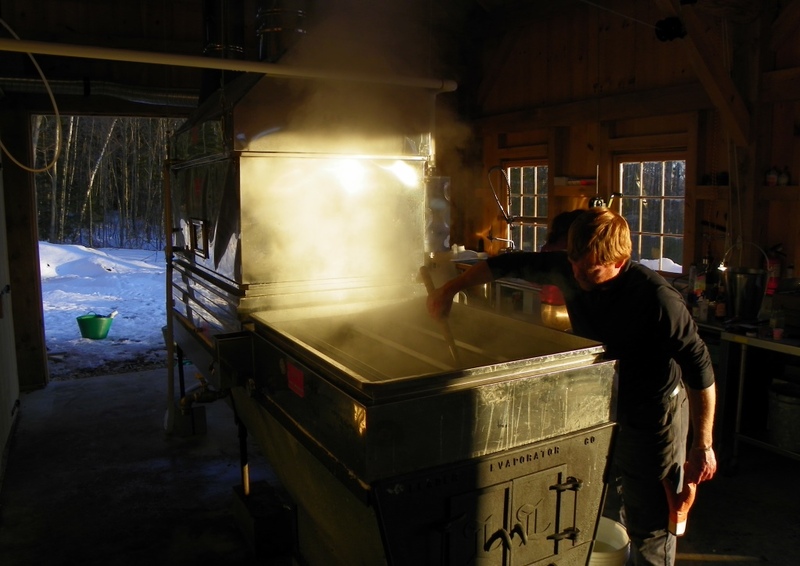 Boiling one run to syrup and waiting for the sap tank to fill again might not seem so bad, but sugaring season can end abruptly and each run could have been the last as far as anyone knew. To and fro it went (and still goes, for that matter), swinging from spring to winter and back, with the arch fired up to boil when enough sap was available. 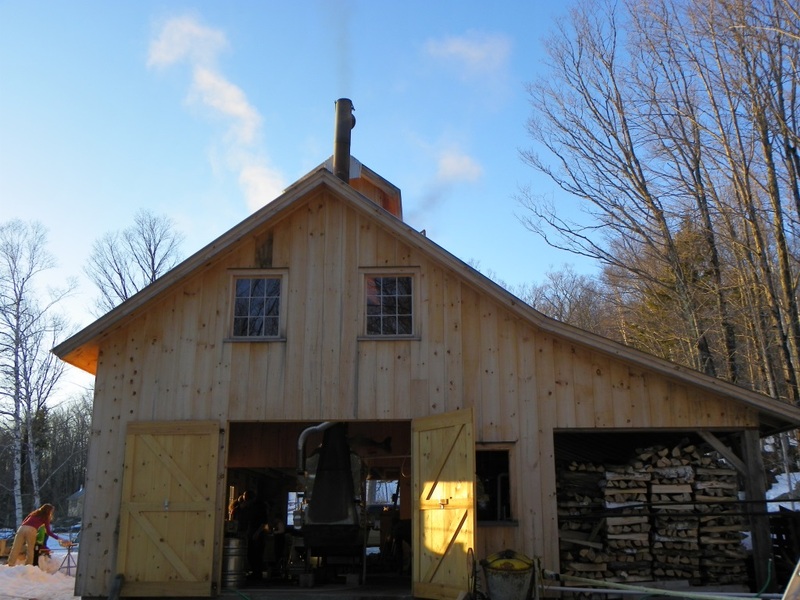 Lovely in late afternoon, with low sun throwing long shadows through the steam, the sugar house on Bobo’s Mountain embodies the romance of Vermont Maple as friends and family gather for fellowship and a taste of sweet syrup, but the crowd thins considerably long before midnight rolls around and the last syrup of the day is drawn off. I’ve been but a helpful distraction, lending a hand at my leisure, but my friends Skye and Tina have been at it late most every day, boiling and bottling every drop of sap that comes their way. It’s going to be a busy few days on Bobo’s Mountain! The official blog of Bobo’s Mountain Sugar can be found here, and I am sure a new post will be up once they’re no longer swimming in sap. You can also visit their page on Facebook here. They’ll be looking to sell what they’ve made soon, so stayed tuned! 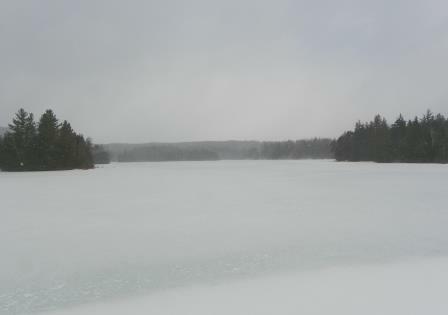 An entire winter’s accumulation of snow sits on top of the ice covering the lake, alternately melting and refreezing but not draining. 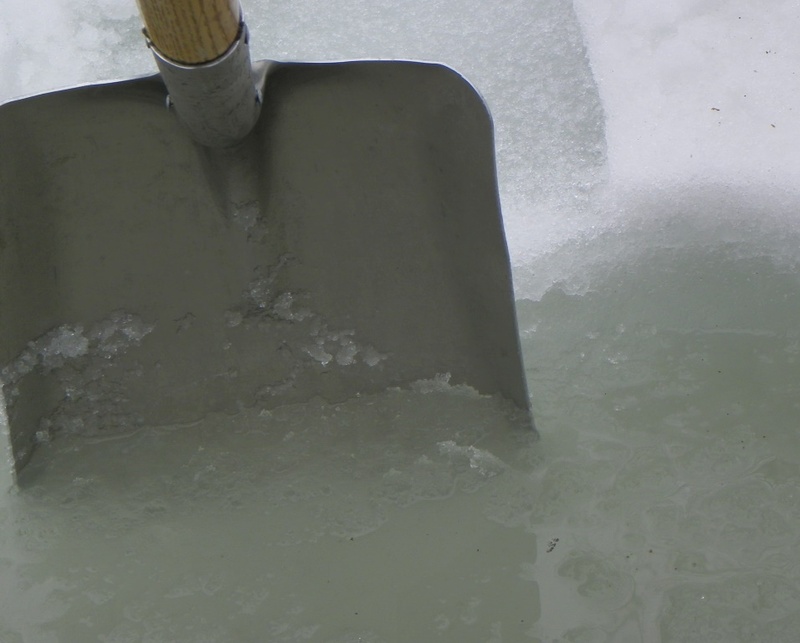 Midway through April, a soft pliable layer of icy snow sits atop saturated slush, floating on top of the weakening ice. 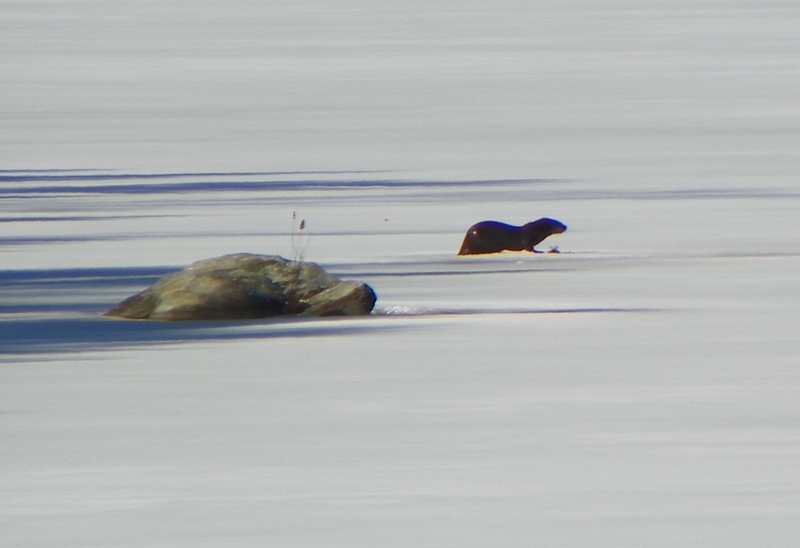 In the coves the ice will still support a moose but at the edge of an island it has softened enough that an otter has clawed itself a hole for hunting, bringing crayfish to the surface for a snack in the warm sun. 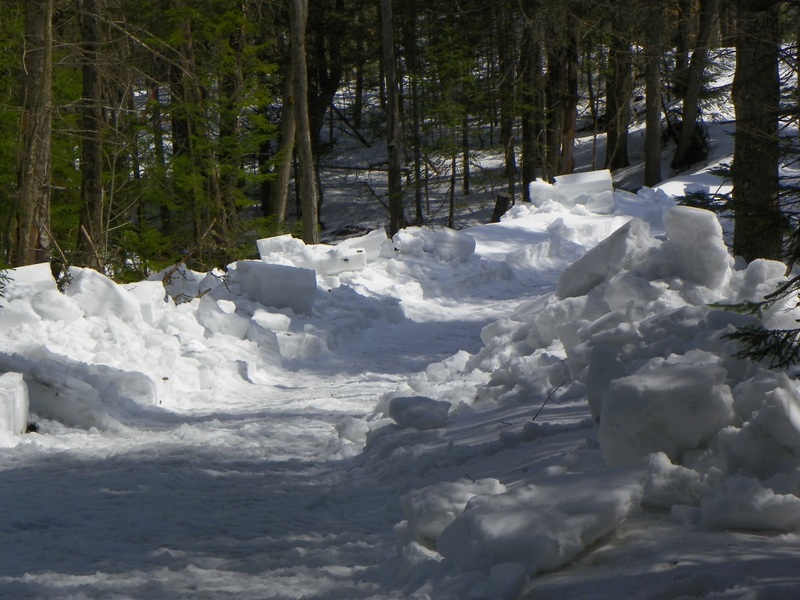 The snow on the roads through the shady woods to the more remote camps needs some encouragement to go away so I chip away with the tractor, figuring that at least a lot more surface area is exposed to the warmth when I’m done. The banks just radiate cold. Opening Day at Fish in a Barrel Pond is less than two weeks away. The members of the Neverwas Nonesuch Angling Society all hope the ice goes out in time but I have no control over that. All I can do is pick away at my lists and hope for the best but, gosh-darn it, these are fly fishers we’re talking about here so you can bet your bippy I’m doing everything in my power to make sure spring will be here when they arrive. Inspirational photos and narrative documenting winter’s retreat. Always love those otter pics. I enjoy the transition times, especially the coming of spring, when anything can happen. The otters are fascinating to watch and man do they chow down on the crayfish! While stalking your blog, I’ve noticed that you post less and less as the weather warms. It saddens me that I won’t be reading your stories as often until next winter. Warmer weather coincides with longer days so by June I am out the door early and not back inside until after dark. We’ll see if we can’t get something posted more often but, with dozens of folks on the property and hundreds of rising fish, sitting at the computer drops pretty far down on the priority list. I’ll have plenty of stories by the time the season is done, but I have to turn most of them into fiction because no one will ever believe the truth! I needed the humor this morning. It’s almost a shame to see that shining photo of jarred syrup then the movie of all that sap pouring on the ground. Brought a tear to my eye. In a way, it’s a good thing the sugar content has been low so the amount of potential syrup wasn’t what it could have been. It was a short-lived event but still kind of jaw-dropping. 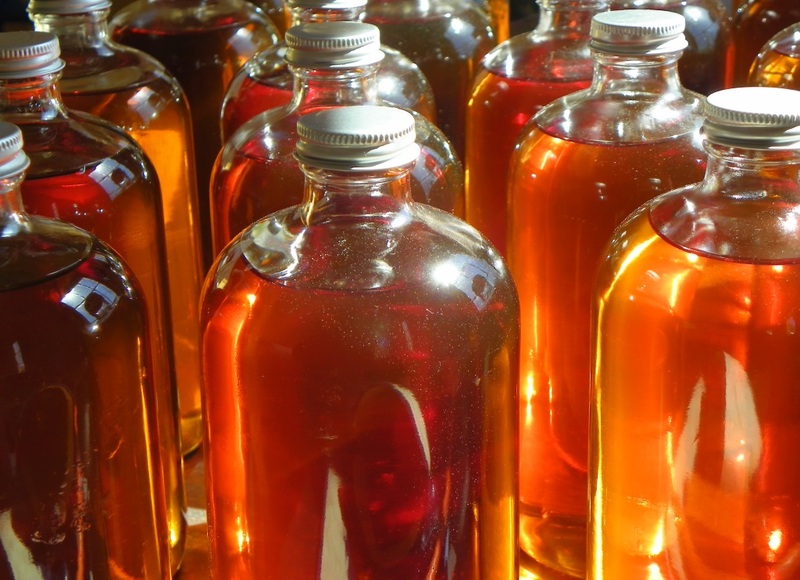 Hundreds of gallons of syrup are safely stored in barrels, so have no fear. I don’t know how you do it Quill but you make melting ice interesting. Seeing all that sap flow out of the storage tank made me want to reach through the screen to stop it! I love your writing! And your pictures too… Thanks for bringing your humorous insight into your stories. Always fun to read. 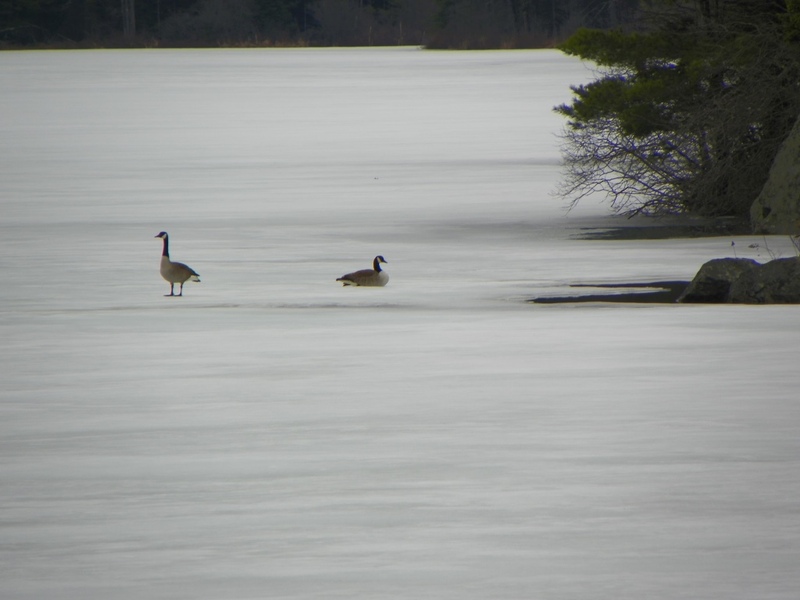 I was up in New Hampshire two weeks ago for Opening Day and the ice was still six inches thick on the pond. Crazy weather. Maybe the state has dumped it’s requisite stock of Brookies by now. Hopefully you’re surviving the late spring with further melting of the psyche. No sugar maples, but we had a similar stop and go teaser of a spring in Wyoming. Great to see shared perspective from so far away. Thanks for the great post.